Castle Connolly Medical Ltd. has recognized Dr. Helga Pizio as one of America’s Top Doctors®! This prestigious honor is awarded to only the best physicians in particular specialties, based on extensive criteria put forth by Castle Connolly. This is the third time Dr. Pizio has been named as a Top Doctor by the organization. 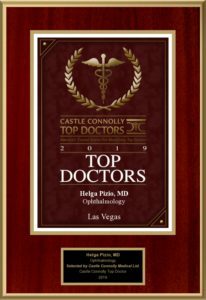 In order to be recognized as a 2019 Las Vegas Top Doctor in ophthalmology, Dr. Pizio had to first be nominated by several other doctors and healthcare professionals as someone they felt demonstrates excellence in her field. Once nominated, Dr. Pizio and her fellow candidates were then reviewed by Castle Connolly’s physician-led research team, which carefully examined each nominee’s background. To complete this process, the team interviewed various clinical department chairs, esteemed specialists, and vice presidents of medical affairs. This investigation included evaluating each nominee’s board certifications, professional honors, hospital affiliations, education/training, administrative positions, history of disciplinary actions, and more. Once the review was completed, doctors who received the most nominations and proved to have exemplary skills, a reputable background, and exceptional credentials were ultimately named as Top Doctors. Castle Connolly completes this process each year, providing patients with the most accurate and up-to-date listing of outstanding physicians in various medical specialties. Dr. Pizio is proud to be considered among the best ophthalmologists in Las Vegas, and she looks forward to continuing to provide top quality eye care to patients throughout the Las Vegas Valley. To schedule a consultation with 2019 Top Doctor Helga F. Pizio, MD, FACS, please contact New Eyes today. 8352 W. Warm Springs Rd.